This 30-Minute Rice Noodle Soup recipe is great for last minute meals. 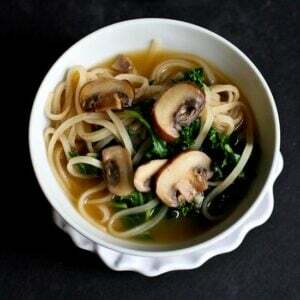 The mushrooms and kale are not only healthy, but add fantastic flavor! I wish I could say that I’m one of those people who has my meal plan for the coming week beautifully laid out by Sunday evening, ready for an efficient, once a week (ha!) trip to the grocery store. In reality, it’s 5pm on a weekday and I have no flippin’ idea what I’m making for dinner. If I’m lucky, I may have thought to defrost some chicken or salmon earlier in the day, or picked up some ground turkey or pork chops during my all-too-regular grocery runs. And then there are the times when I’m not even organized enough to defrost or purchase (humor me and tell me I’m not the only one!) At that point, a mad scrabble through the pantry ensues. For those of us who are organizationally challenged, a well-stocked pantry is a necessity. Well, unless your family is okay with eating sandwiches or scrambled eggs every night. That would never happen in my house. One of our pantry staples is rice noodles, either for soups like this one or one of our favorite dinners, Rice Noodles with Chicken, Asparagus & Soy Ginger Sauce. Either dish takes only 20 to 30 minutes to prepare, but I look like a rock star because my family thinks that rice noodles are from heaven. This soup is one of those meals that will warm you to your toes, without being too heavy. 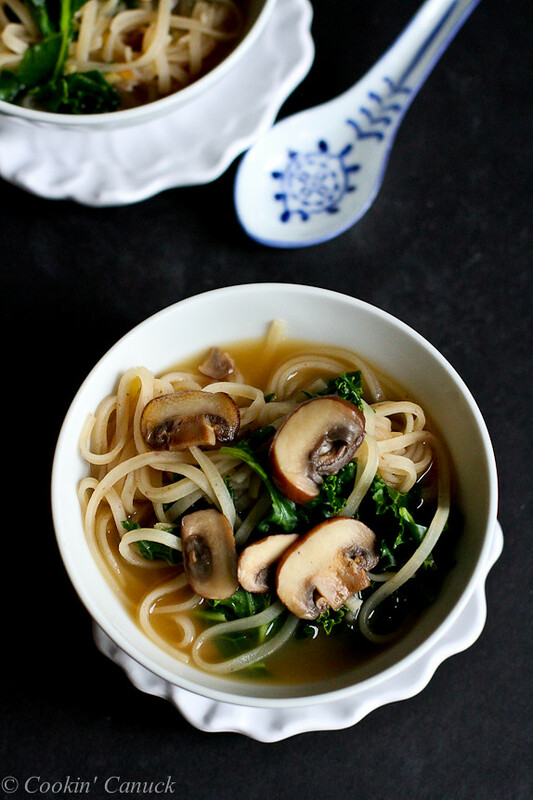 Because the broth is so light, I happily eat this at any time of year. If you have leftovers, you may need to add a little more broth when you reheat the soup, as the noodles tend to absorb the liquid the longer they rest. Lightly coat a large saucepan with cooking spray. Set over medium heat and add the canola oil. Add the mushrooms and ginger, and cook until the mushrooms are tender, 3 to 4 minutes. Add the garlic and cook for 1 minute. Season with salt and pepper. Pour in the vegetable broth, soy sauce (or tamari) and hoisin sauce, bring to a boil, then lower to heat to medium. Stir in the rice noodles and cook until the rice noodles are tender, 5 to 6 minutes. Stir in the kale and cook until the kale is slightly wilted, about 1 minute. Serve. * For gluten-free, be sure to use gluten-free hoisin sauce and soy sauce (tamari). Nice and easy. Thanks Dara. First of all I am loving those noodles. Then hoisin sauce and kale? Oh, yeah! oh my goodness, I love every single thing about this soup! Yeah, you would think being a food blogger I would always have dinner planned out and on the table in a timely manner and in high fashion but no. Usually I’m exhausted from work and the darlings and am scrabbling for something edible. 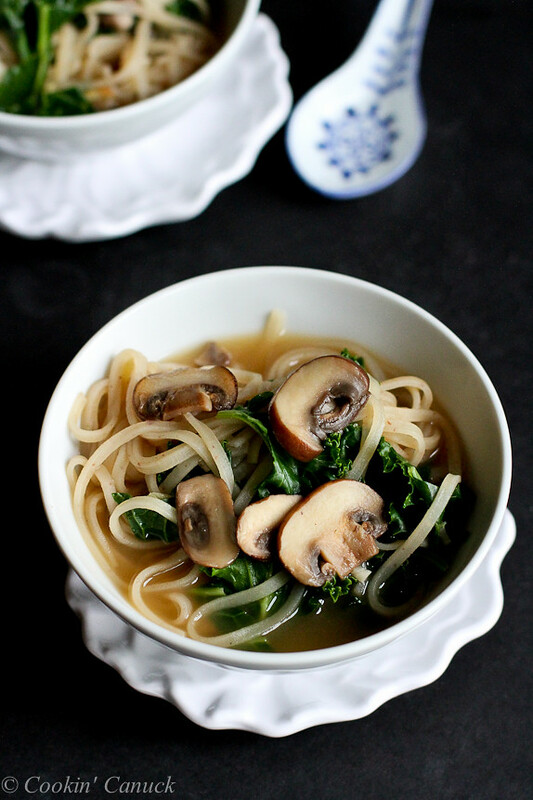 I love, love, love the flavors and simplicity of this soup! Thanks for sharing Dara! I know as well about the all too regular grocery runs! I try to have a white board with my very loose menu plan so at least I get the meat needed to defrost, it’s all dependent though on the kids and activities but I try to plan accordingly. Love an easy meal like this! 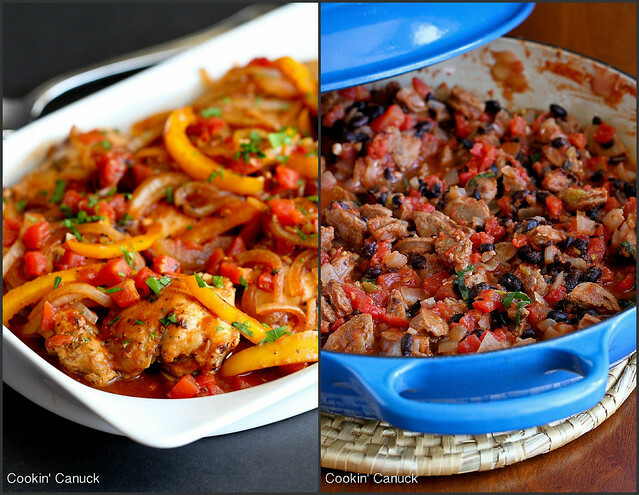 It’s always great to have a few recipes on hand like this when time is tight! Looks delicious! Oh my goodness YUM! 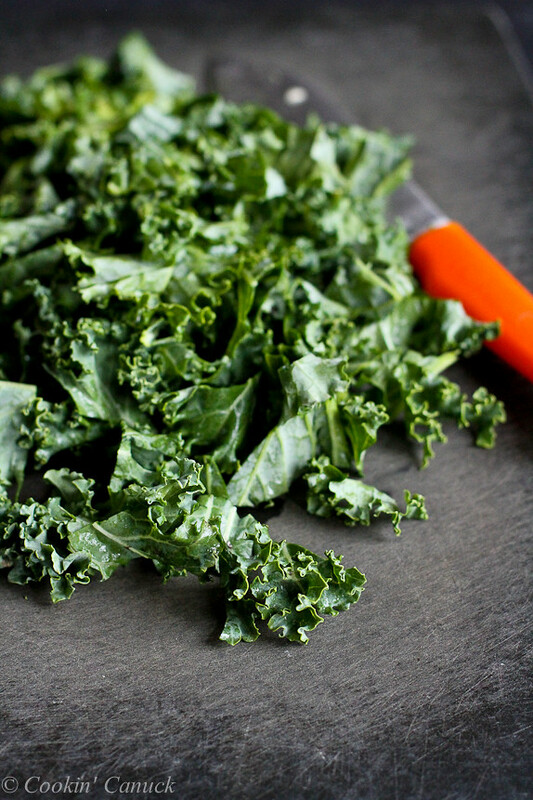 I love the addition of the big leafy kale! Totally making this! Ha, it’s like you are writing about me. I never meal plan, it’s so bad, I always wing it. This soup though, it’s perfect when you are in a pinch! This soup is gorgeous! Utterly gorgeous. There are times when I’m super organized in the kitchen and with what I’m planning on cooking, and then there are times I’m completely clueless and lazy. Tonight I’m clueless and lazy. Wish I had the ingredients on hand to make this soup. I’d totally love this tonight! Oh, what to make for dinner on a cold, rainy night? This soup is the answer! I made this tonight and it is so wonderful. 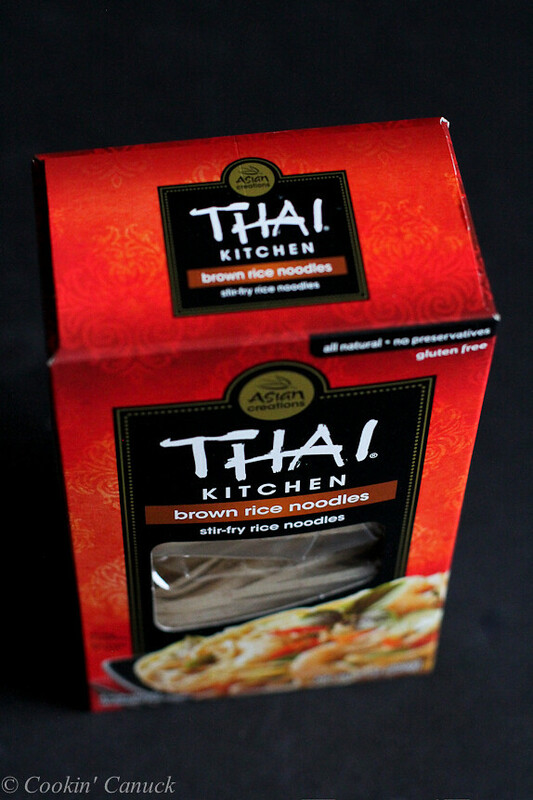 I actually found the brown rice noodles at Walmart (much to my surprise). I almost bought them on at Amazon for a whopping $10 a box! I’m so happy didn’t. I paid $2.99 a box at Walmart. Thank you for sharing. I will be making this recipe again!